Kristie Lefebvre had never even driven a motorhome. When her husband Jimmy suggested the Can-Survive Walk to her, she had a couple of reservations. Now, with a month left before the walk concludes, Kristie has warmed up to the idea. Kristie, who’s been walking with Jimmy, his mother Rita and their three youngest kids, loves to live an active lifestyle. Her favourite pastimes are skiing, snowboarding, and hiking. Through fitness training and healthy living, she lost 54 pounds and feels like she has a lot more energy. 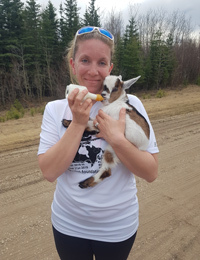 One of her hopes is that through sharing her family’s story with the Can-Survive Walk people will become more aware of the benefits of a healthy lifestyle and realize that “they can live longer by being active and healthy and by keeping their body moving”. With a career as a nurse’s assistant, Kristie is passionate about helping those in need. 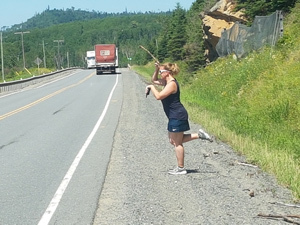 Covering approximately 46 kilometres per day over the course of about 8-10 hours each day, Kristie and the family have settled into a routine, where Kristie and Rita swap places driving the motorhome along the shoulder of the highway, while Jimmy communicates with them over a radio. “It was a little bit of a struggle at first until we figured out a routine and a pattern,” Kristie explains. “After we figured that out, it hasn’t been too bad. It’s actually been quite enjoyable — all the things we’ve been seeing and doing. 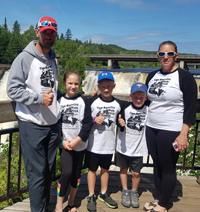 The stop in Thunder Bay was the family’s first day off since they started their walk. Another highlight of the journey also happened in Thunder Bay where the family was honoured at a baseball game. The kids were able to participate by throwing the first pitch and singing the national anthem. Thinking about walking across Canada yourself or with your family? Kristie has a few words of advice: “Don’t do it with a motorhome following you!” Apparently, it can be a bit of a challenge to drive. But as with many things in life, Kristie’s found joy in constantly moving forward. So well spoken Kristi. You and your family are in the process of doing something most people would not consider. Lack of commitment and lack of interest hold them back. One thinks very differently when cancer takes the life of one you love so dearly. Your family is making a difference. SO SO proud of you all.